They discussed logistic projects to boost goods turnover. Ukrainian President Petro Poroshenko and Moldovan Prime Minister Pavel Filip visited the Mayaky-Palanka-Udobne border crossing point which is due to be opened in 2018. According to the Ukrainian president's website, the parties agreed that in the framework of the Eastern Partnership project and the project of integrated border management, the modern border crossing point with modern equipment will be built jointly with the EU. Poroshenko noted that the EU allocated funds for the implementation of the given project. "Honest people should not have problems at the border. They will be surveyed once by both Moldovan and Ukrainian border guards," he said, adding that equipped with modern video surveillance and high-speed Internet connection. The parties also reached an agreement to build the common modern border crossing point Kuchurgan-Pervomaysk with participation of the EU. The president said the ongoing reconstruction of the Odesa-Reni motorway was expected "to improve the development of southern Ukraine, Odesa region and our interaction with Moldovan side". Ukraine also plans to build a ferry connection between Ukrainian Orlivka and Romanian Isaccea across the Danube River. It is also planned to build the bridge with participation of the EU to reduce distance between Odesa, Romania and Bulgaria. "This will intensify trade turnover and supply of goods from Moldova and Ukraine to the European market," he said. 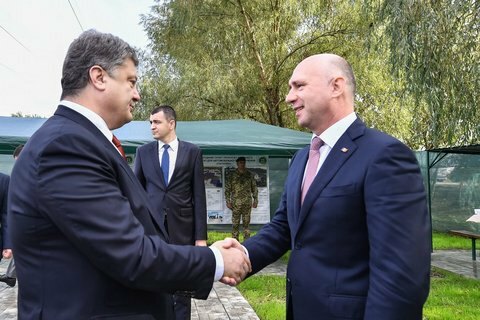 Poroshenko and Filip visited one of the remote border crossing points to check the conditions of service and the border area. Poroshenko noted that an increase in the number of border guards at the passport control, access to the Internet and the Interpol database at border crossing points had been organized pursuant to his instruction. "In fact, from late August we can observe normalization of the situation on the border", he said. Israel should stop shying the problem of illegal employment of Ukrainians before it is too late. The Kremlin's policy is based exclusively on the Putin regime's desire to cling to power for as long as possible.